Program – Chesapeake Chapter U.S.L.H.S. HISTORY AND THE IMPORTANCE OF PRESERVING THEM FOR THE FUTURE. The Chesapeake Chapter, U.S.L.H.S. 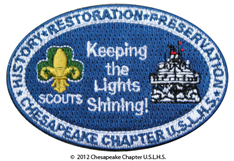 “Keeping the Lights Shining” Scouts Patch Program is to educate scouts on the role of lighthouses in the Chesapeake Bay area; their history, keeper’s life and the importance of preserving them for the future. For Girl Scouts, starred activities fulfill requirements for the Lighthouse Try It, Lighthouse Badge, Lighthouse IPP and completes an activity for the Chesapeake Bay Patch. For Boy Scouts, starred activities fulfill some of the requirements for the American Heritage Merit Badge. © March 2012 – Patch design and program written by Maria Alvarez-Lundie, Communications Director, Chesapeake Chapter, U.S.L.H.S. Adapted from website research on Lighthouse Patch programs from GS of Northern California, Girl Scouts – North Carolina Coastal Pines, Suffolk County Girl Scout and Girl Scouts of Central and Southern NJ, Girl Scouts of Central Maryland and Boy Scouts merit badge information. A 2013 grant received from the Phase Foundation facilitated the purchase of the patches.